Old Marine Engine: The Racine Boat Mfg. Co. Racine Wisconsin. Here are several pictures of a single cylinder "Racine Boat Mfg. Co." marine engine I picked up today. The flywheel is 3 inches wide and 13 inches in diameter. To bad the carb is gone. Denis, Jim Fehl restored a later Racine Pierce, similar looking engine. He borrowed my mixer and duplicated it, I believe he had an extra cast. Looking at your engine I would think they were from the same family, yours is early with the pedestal base. What I like about this little marine engine is that it has retained its cast brass name tag. For this reason there is no doubt as to the name of the company and where it was situated. The name "Racine Boat Manufacturing Company" in Racine Wisconsin could have only been found on engines built between 1895 and 1903. 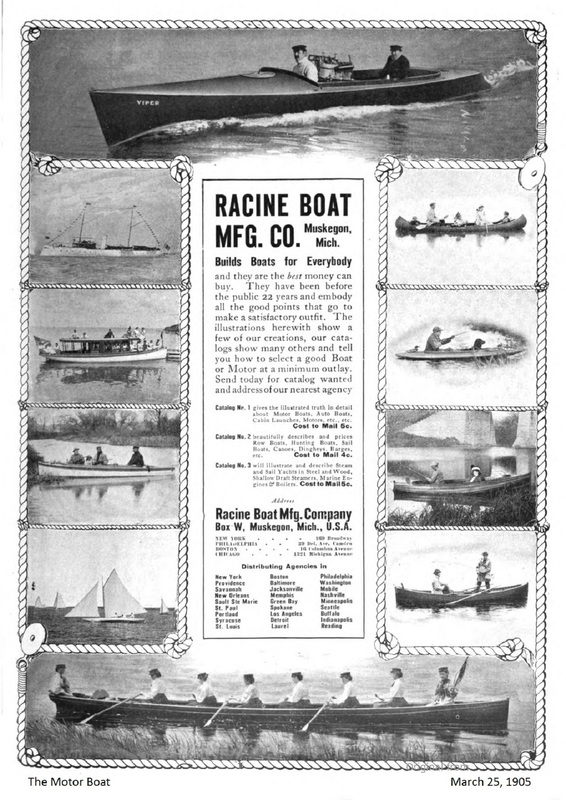 In earlier years of that period the Racine Boat Mfg. Co. were building steam engines. Their gasoline engines were made in the last few years of the time period. It is not known if their first engine started with a steam engine serial number 1 and progressed to their gasoline engine serial number 1596+. Are there any other known (steam or gasoline) engine with a Racine Boat Mfg. Co. built in Racine Wisconsin? It would be interesting to know how high the serial numbers ran on a Racine Boat Mfg. Co. Racine Wi. engine. 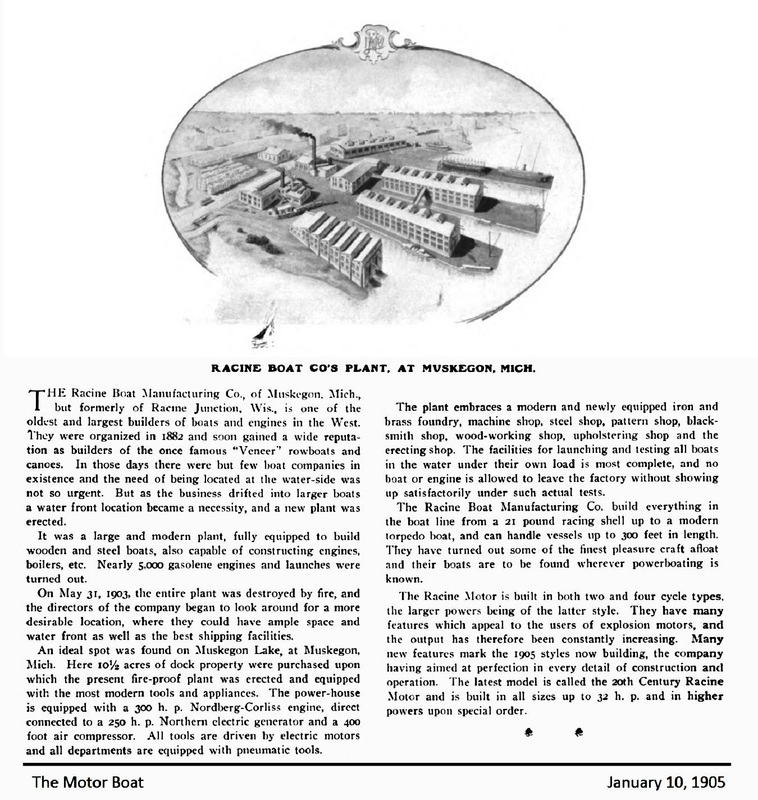 Racine Boat Manufacturing Company lost its plant in Racine, Wisconsin in May 1903. When it was unable to acquire additional land for expansion, it moved to Muskegon, Michigan, the following year and established a large plant on the lakefront. According to Michigan Bureau of Labor and Industrial Statistics, in 1905 it produced 3,005 boats valued at $300,000, and it employed 322 people. It merged into the National Boat & Engine Company in 1910-11, which promptly went bankrupt, and the salvageable pieces reorganized as Racine-Truscott-Shell Lake Boat Company, which in turn failed in 1915. This would place a Racine Boat Manufacturing Company engine labeled as being built in Muskegon at between 1904-1910. Their foundry later became the startup of Campbell-Wyant-Cannon. Forgot to mention that the loss of the plant in Racine was due to fire, and that the Muskegon Chamber of Commerce offered them lakefront property and $20,000 to move there. I wrote about them briefly in my new book, Making Waves: Michigan's Boat-building Industry, 1865-2000, University of Michigan Press, 2015...And thanks to all the folks who participate on this site who helped make it possible!